FELL works with skilled and experienced organizations to be able to achieve our vision and comply with our values. We work with the most experienced distributor partners in the marine market across the globe. Become retailer in your region by contacting one of the distributors below or make contact with us directly. CWR Electronics offer nationwide distribution to dealers and retailers. West Marine Pro offers nationwide distribution to dealers and retailers. All FELL Marine products are also available in West Marine stores. Fisheries Supply offers distribution mainly on the west coast and sell in store from their retail store in Seattle. Marine Equipment and Supply Co. offers distribution out of New Jersey focused on the north east region. Disvent Ingenieros have been supplying the Spanish Marine Industry since 1985, with headquarter in Barcelona and office in Madrid. Disvent Ingenieros is our strategic distribution partner in Spain. The 70 year old company first worked with radio and cinema, and then developed their business into telecommunications, navigation and fishing gear. Friðrik A. Jónsson is our strategic distribution partner in Iceland. Ferropilot is ELNA’s distribution division for the leisure marine market. Since decades, customers include retailers, shipyards, installers and many more. The Ferropilot portfolio includes innovative products from numerous international manufacturers. This includes among others emergency equipment, audio systems, solar panels, electric components and (automatic) trim tab systems. Every year, Ferropilot presents at the world’s largest watersports trade fair boot in Dusseldorf. ELNA/Ferropilot is our strategic distribution partner in Germany. Kiwi Yachting have been supplying the NZ Marine Industry since 1988. Kiwi Yachting is our strategic distribution partner in New Zealand. Marintek supplies goods to more than a hundred point of sale scattered along the coastline of Turkey, boat builders, marinas, and other service providers, as well as provides after sales services. Marintek is our strategic distribution partner in Turkey. Caruana Marine Centre was established in 1999, and during these years they have placed themself in the front line of marine electronics, electrical and mechanical supplies and repairs in the Maltese Islands. Caruana is our strategic distribution partner in the Maltese Islands. Riz Itea is our strategic distribution partner in Croatia. Wholesale organization Jan Comstedt AB operate in the Marine and industrial sector. Founded in 1983 by Jan Comstedt, with his then thirty years of experience in the Swedish marine market. Comstedt is our strategic distribution partner in Sweden. Oy Maritim Ab is our strategic distribution partner in Finland, Russia and the Baltics. Navicom is a leading French wholesaler and distributor of marine and industrial equipment. Navicom was founded in 1980, has several hundred dealers in France and own product lines in marine electronics. Navicom is our strategic distribution partner in France. Aquafax is a leading international wholesaler and distributor of marine and industrial equipment. Aquafax specialise in distributing over 16000 products, sourced from all over the world. Aquafax is our strategic distribution partner in the UK and Ireland. NMS is one of Norways largest distributors of marine equipment. NMS and Martim Norway is affiliated companies where Maritim is the largest boat equipment retail chain in Norway. NMS is our strategic distribution partner in Norway. In 1965 Mr. Exalto started a small marine shop in the Netherlands, in the small village of Hardinxveld-Giessendam. This small marine shop has grown into what is now known as the Exalto Group. The Exalto Group has now 3 business-units: Parts, Wipers and Propulsion and subsidiaries in Hardinxveld-Giessendam (The Netherlands) and Grou (The Netherlands/Friesland). Exalto is our strategic distribution partner in the Netherlands and Belgium. 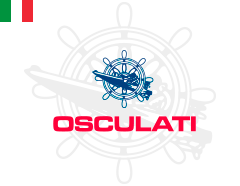 Osculati is the biggest nautical accessories distributor in Italy and one of the leading companies in the European marine market. Osculati is not only one of the most important retailers in the trade section with about 18000 references in its catalogue, but it can also boast a production of over 7000 articles, designed and developed inside the company by its Design & Engineering department. Osculati is our strategic distribution partner in Italy. Palby Marine is Denmark’s largest wholeseller and send orders everyday to stores, shops, and yards. Palby Marine is our strategic distribution partner in Denmark. EVAL E.G. Vallianatos S.A. is a producer of marine lifesaving equipment and marine accessories. The company was founded in 1976 and the company’s product range exceeds the 6.000 codes of marine accessories, docking and anchoring equipment, standard, electrical and electronic equipment, hydraulic equipment, fishing equipment, water sports etc. EVAL is our strategic distribution partner in Greece. EVAL is our strategic distribution partner in Portugal.